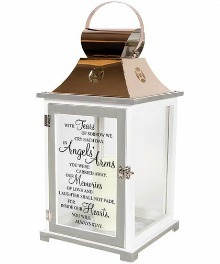 This 18 1/2' light up memorial lantern is made form quality wood and stainless steel copper finish top. Built in automatic timer 6 hours on, 18 hrs. off. Runs on 3 AAA batteries, included. Quote "With tears of sorrow we cry each day, in Angels' arms you were carried away. Our memories of love and laughter shall not fade, for inside our hearts, you will always stay."